Hi folks! 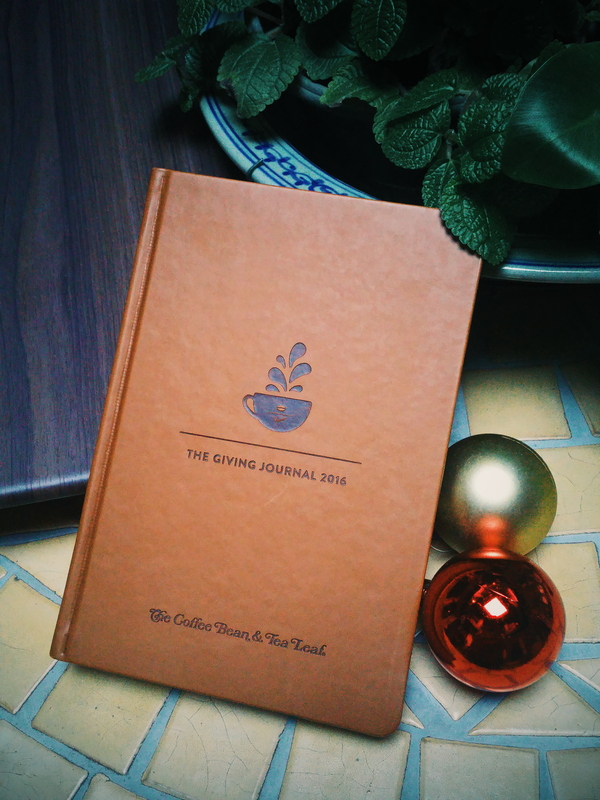 Liz Lanuzo of Project Vanity graciously lent me her Giving Journal for me to check out. 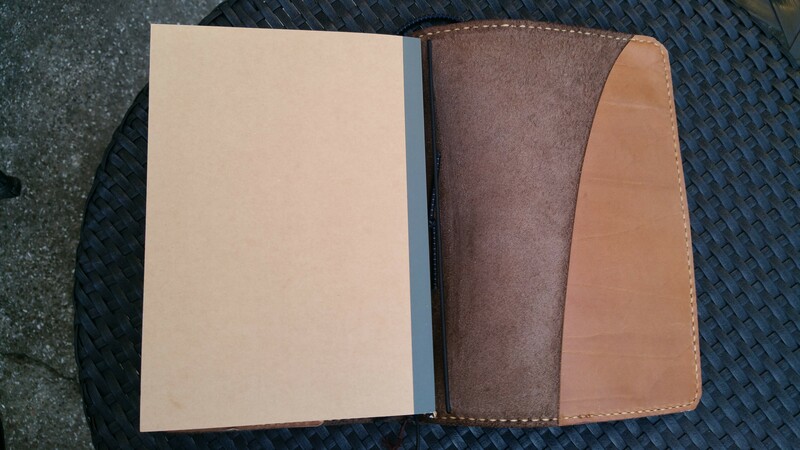 I thought I’d share with you some shots of the cover and interior for you to make up your minds about whether to go for this yearly diary, the Starbucks Moleskine 2016, or Seattle’s Best diary. I hope you don’t go for all three- you might get diabetes from all those crazy frappe drinks they make you buy to get one of these! The cover. 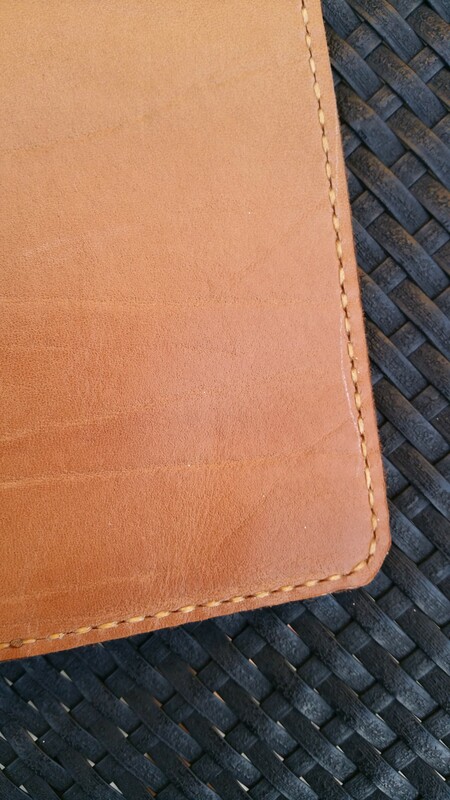 It’s tan faux leather, very simple and clean design. Quite smooth and slick. I’m not sure it’s waterproof- water might stain it, so keep away from coffee. 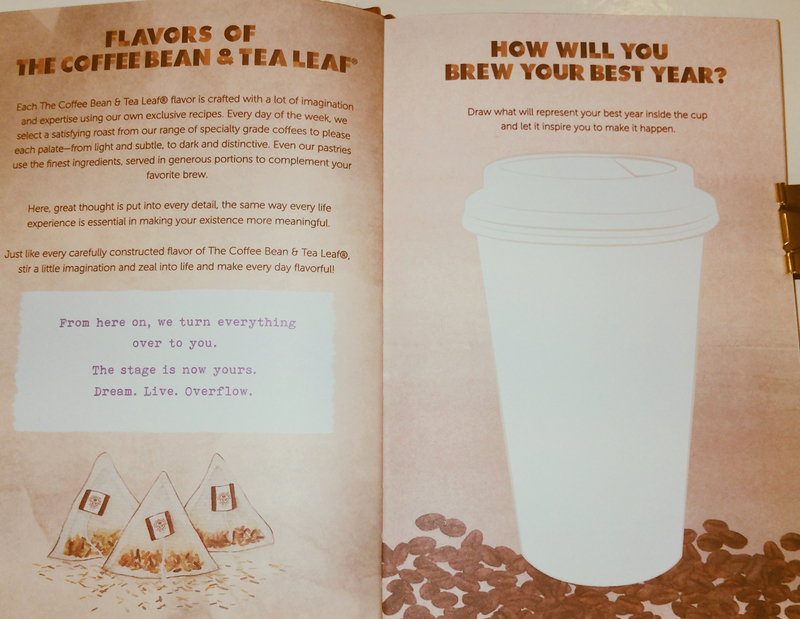 There’s some info about CBTL. 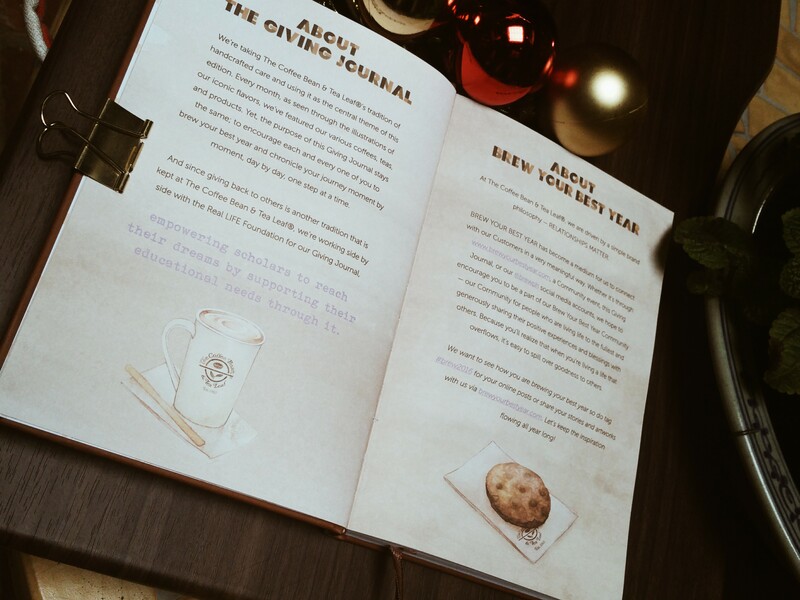 Next we have some background on The Giving Journal. Apparently it’s working with the Real LIFE Foundation which has something to do with education. This seems like a worthy endeavor although who knows what that really means? Do they get a portion of each Journal distributed or what??? I wish they’d tell us. I hope those street children are getting something out of this! 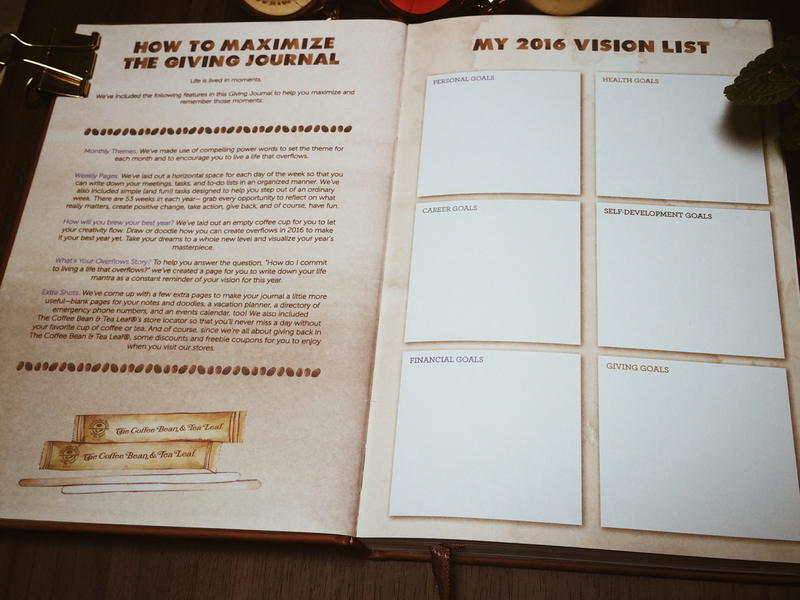 Then we have a recommended user’s guide to the Journal, as well as a “Vision List” to help you list your various Goals for 2016. I kinda like this part, it seems useful for those January 1 resolutions that we always forget (or ignore) in a week. Then there’s some self-empowering poetry. Moving on…. There’s a page about drawing your inspiration for the year. Again, I like that they encourage you to visualize your goals. You’re out of luck if all you can draw is a stick figure though. I guess you can write them down. But all in all, it’s a great idea to visualize your goals, desires, and inspiration. Next, a page of your best 2016 moments of the month, and Travel Plans. I like the Flavorful Moments one better because in a way, it encourages you to be grateful for the joys of the year- and gratefulness leads to health, as they say. As for Travel Plans…one can dream. Sigh. Ah, a calendar! Finally, we get to the bones of the diary. Let’s not forget the coupons though. 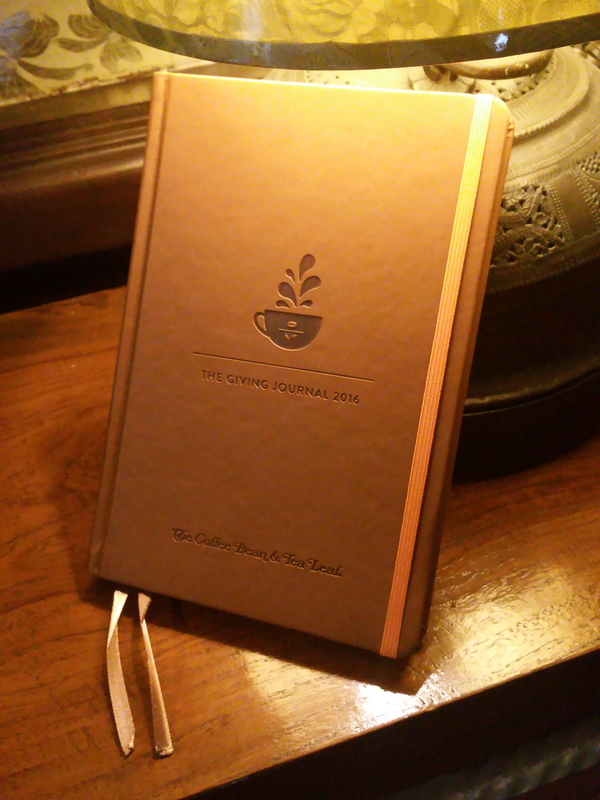 I seldom use them because I hate tearing things out of a planner, but if you drink CBTL enough to get a Journal, I suppose you will have lots of use for them. I love this! 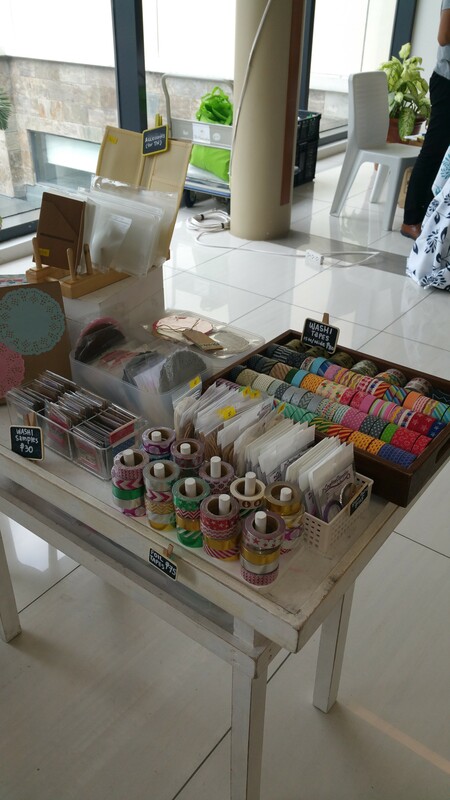 So much space to mark with washi tape and stickers and your plans, of course! 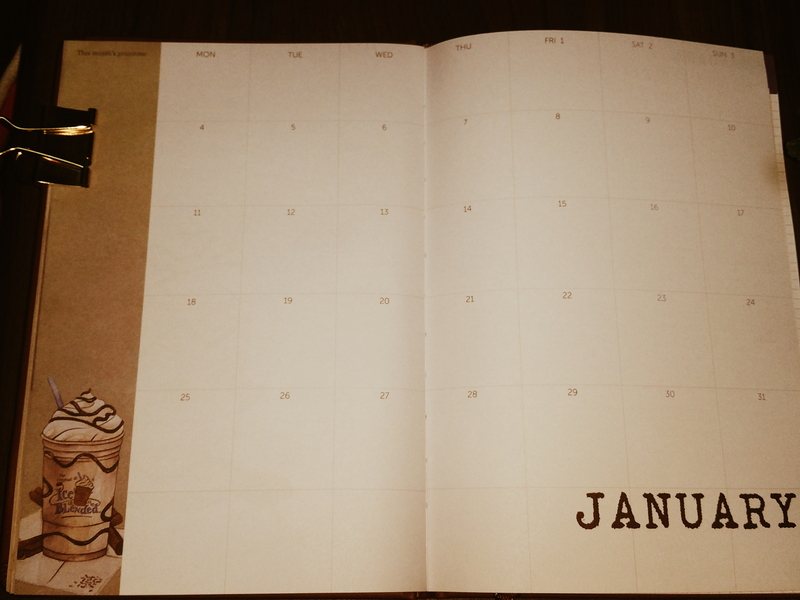 You have one month spread over two pages. Then you get one week over one page, and notes to elaborate on the facing page. Again, I like that the days of the week are dated. 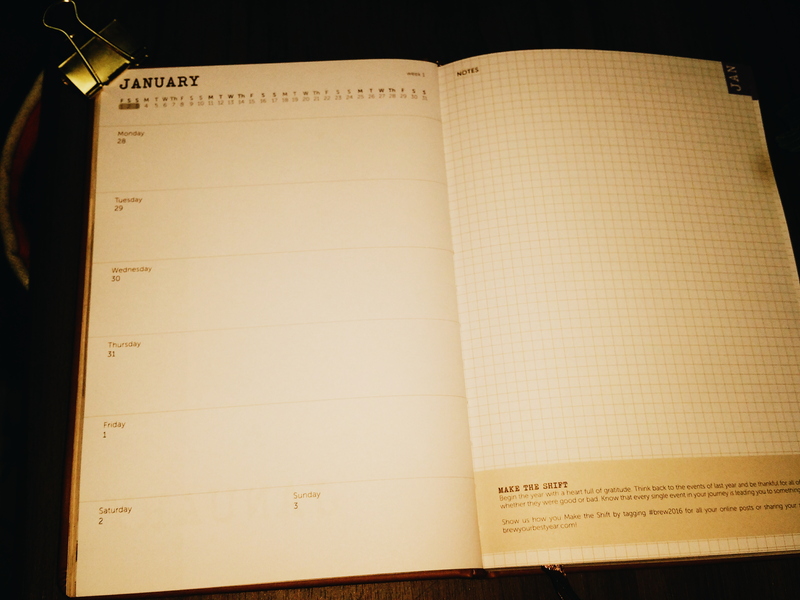 The Midori planner doesn’t have dated weeks. And I really really love grid layouts. Reminds me of the Hobonichi. 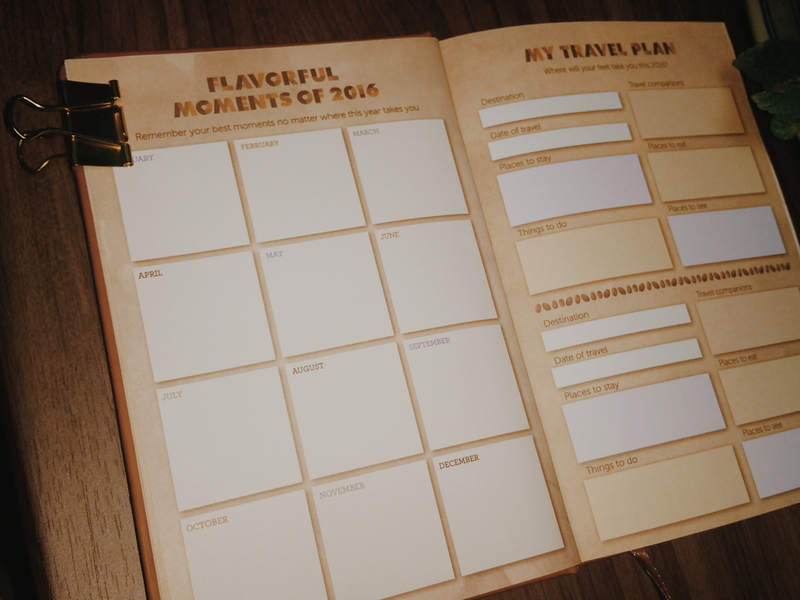 You can also easily use it for Bullet Journaling. There are both blank and grid pages at the back for final notes. Good to use these pages for important information like address and passwords (in code, preferably). 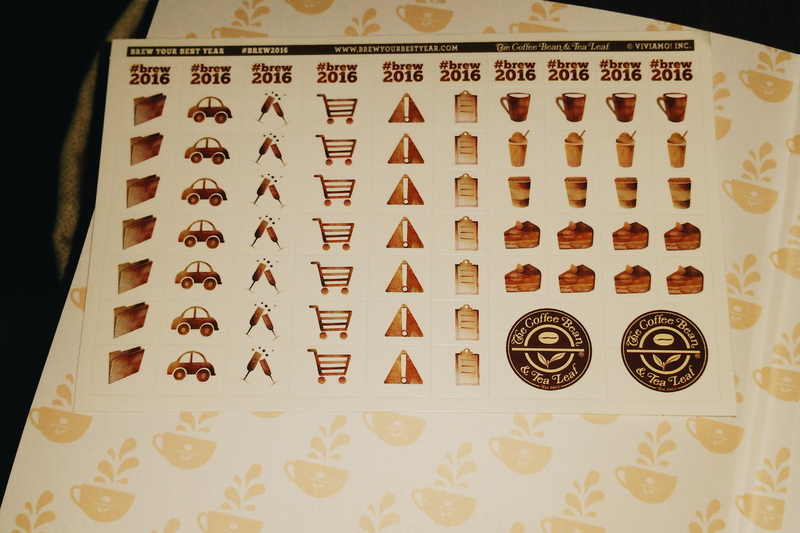 Finally, you get a pocket folder for receipts and ephemera and stickers. Stickers!!! I wish they included more, but at least they have them. Orange ribbon to hold it closed. 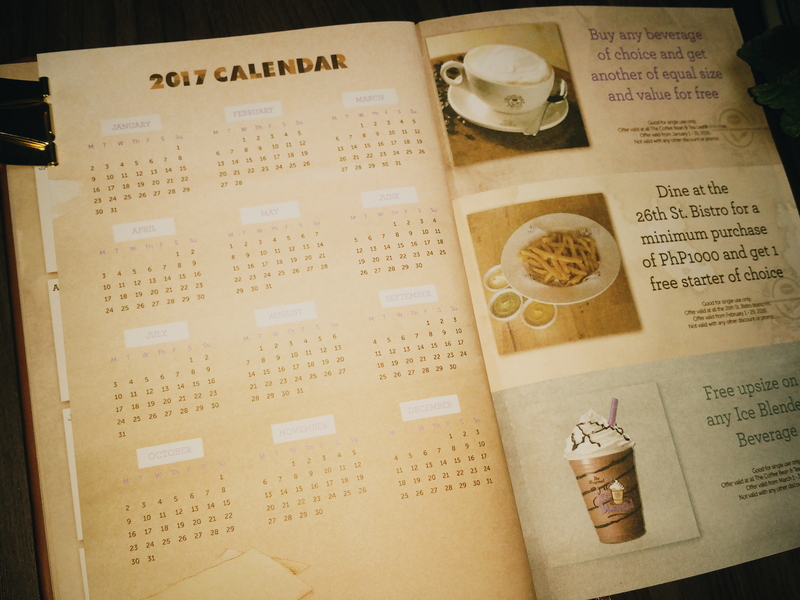 Simplicity in style- besides the coupons and extra goals pages, the calendar pages themselves are clear, well marked, and well arranged. The paper is thick and can withstand fountain pens. The smooth cover feels like it will scratch easily and will be a fingerprint magnet. 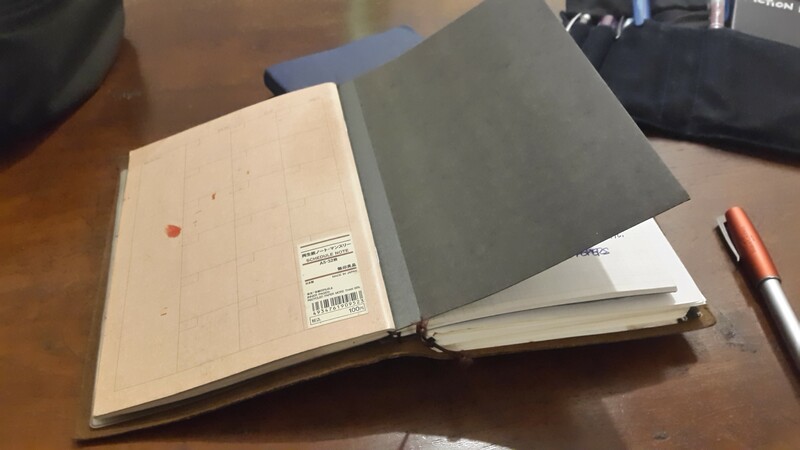 I wish they’d put some texture on it, like the Moleskine covers. 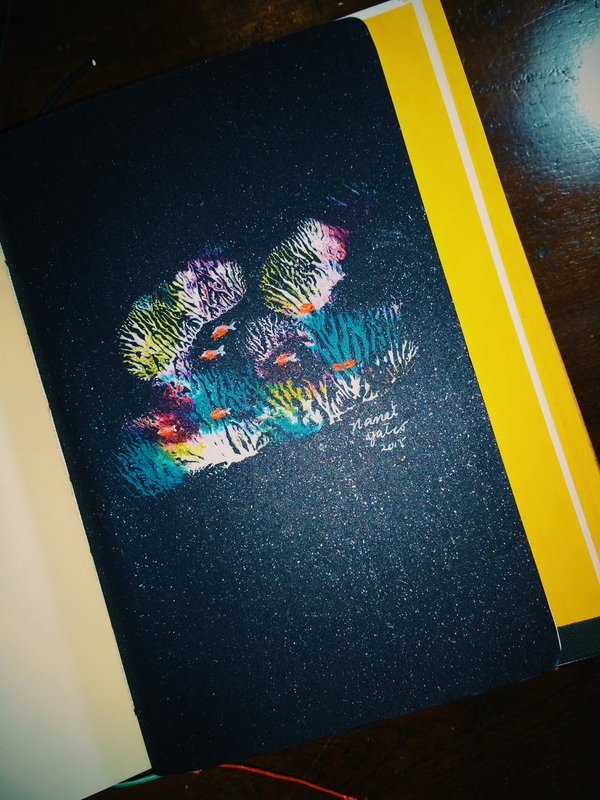 Hardbound- this is a con for me because I like lighter journals, but for others this might actually be a Pro. I’d like a softbound journal so I can insert it into my fauxdori covers. It’s very…sepia. Which makes sense, since that’s the color of Coffee and Tea. If you don’t like brown or variations of it, there’s no other option. 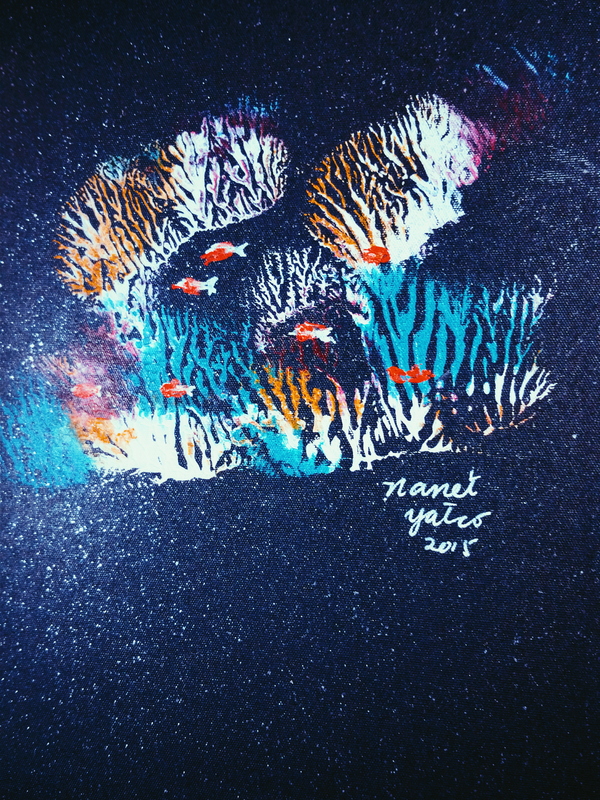 EDIT: I think there are other colors for the covers, but I’ve no idea about the insides. Thanks for the info, Pat! 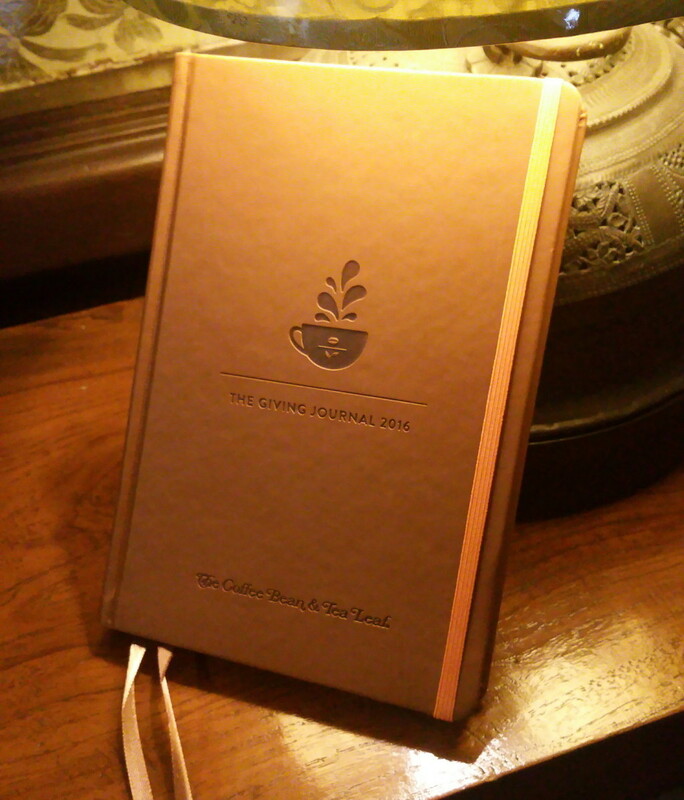 All in all, I think I prefer this journal to the Starbucks 2016 Moleskine- but then again I’m biased because I don’t like Moleskines! Thanks for reading! 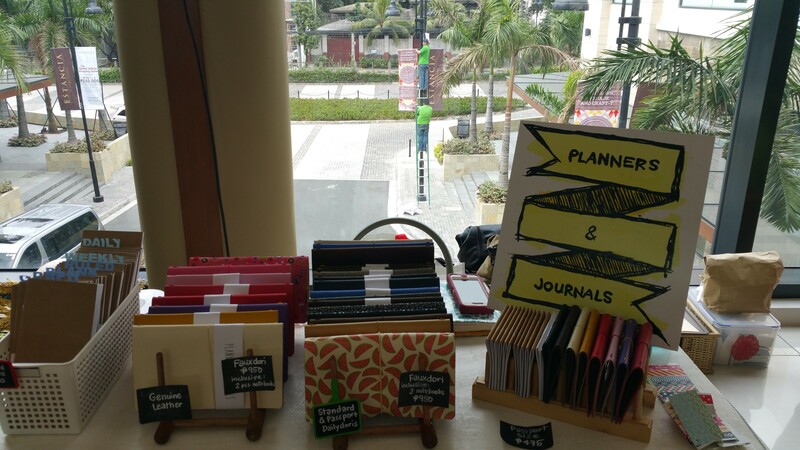 They make Planners and Journals, pretty much what it says on the tin! 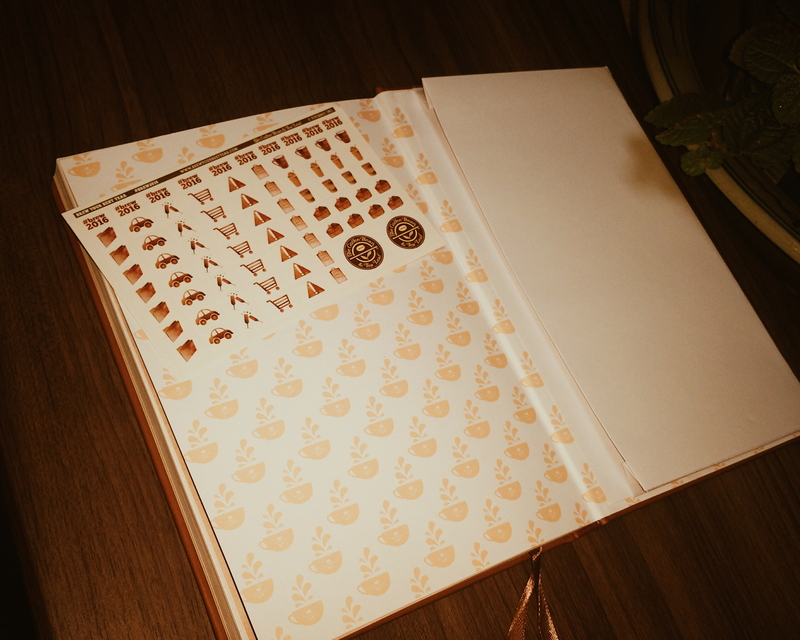 I’m not so much into ringbinders, but they had some lovely fauxdori in real leather, and some cool washi tape. I’m hoping they ramp up their A5 fauxdori production so I can finally get one. I also picked up some pretty inserts from Sketchnotes, including a handpainted one! The paper is 120 gsm and semi-fountain-pen friendly ( a big thing for me, a fountain pen user). I’ve torn through about four or five bags now- brands known for their lightness AND durability. The problem? 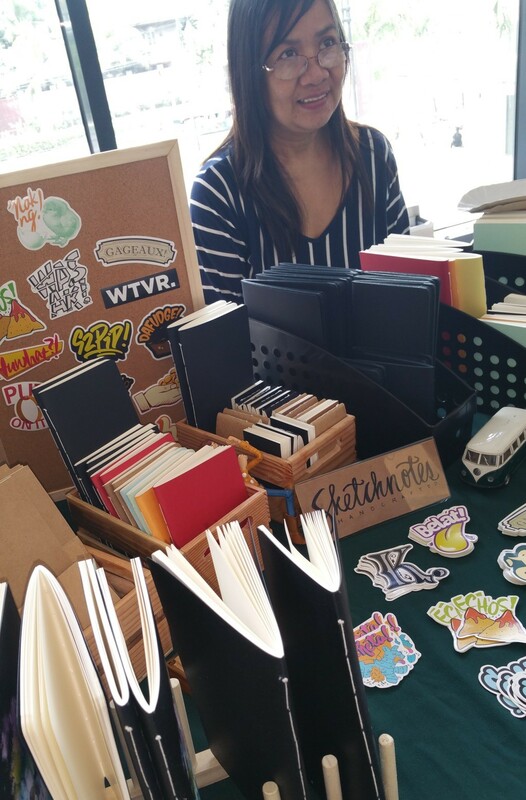 Too many notebooks (and art supplies!). 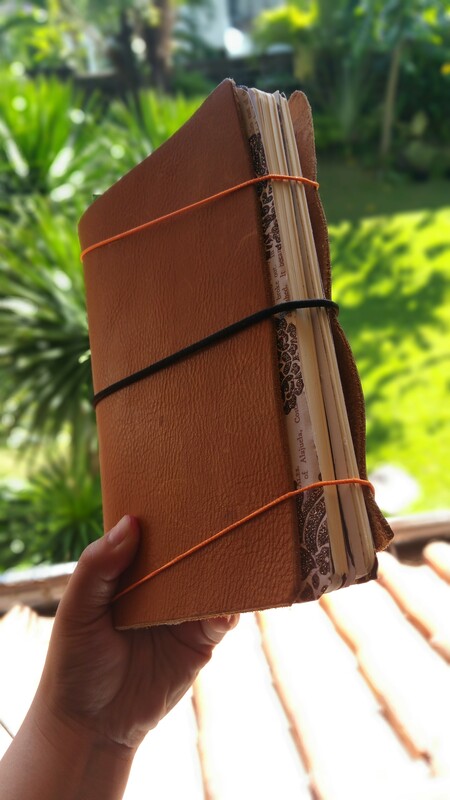 I like to have a notebook for every purpose: rough warm-up sketches, finished ink drawings, random ideas, daily schedules, creative writing ( which in and of itself is divided into several projects), a journal, and of course, notes for this blog. Since I love working in coffee shops, I would need to take my many notebooks, pens, pencils, and sharpeners on the go. Hence, the death of my beloved bags. Well, I’m through with losing so much money on bags! 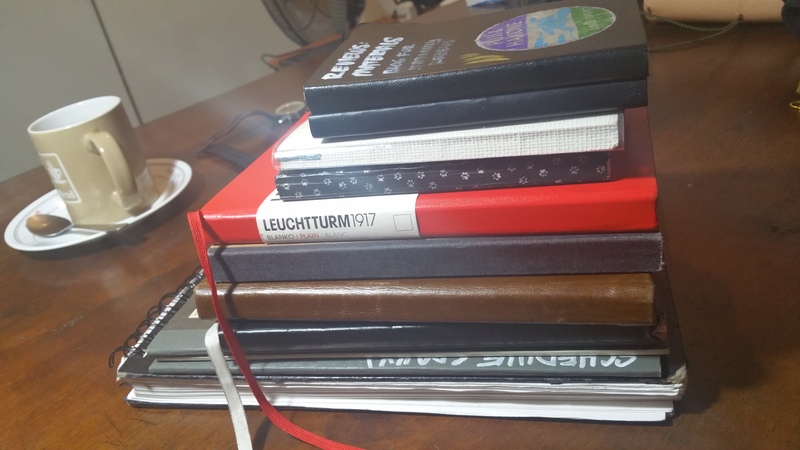 I searched for methods to consolidate my notebooks: ring binders, switching to softbound notebooks only, using that Japanese page-marking hack, etc. 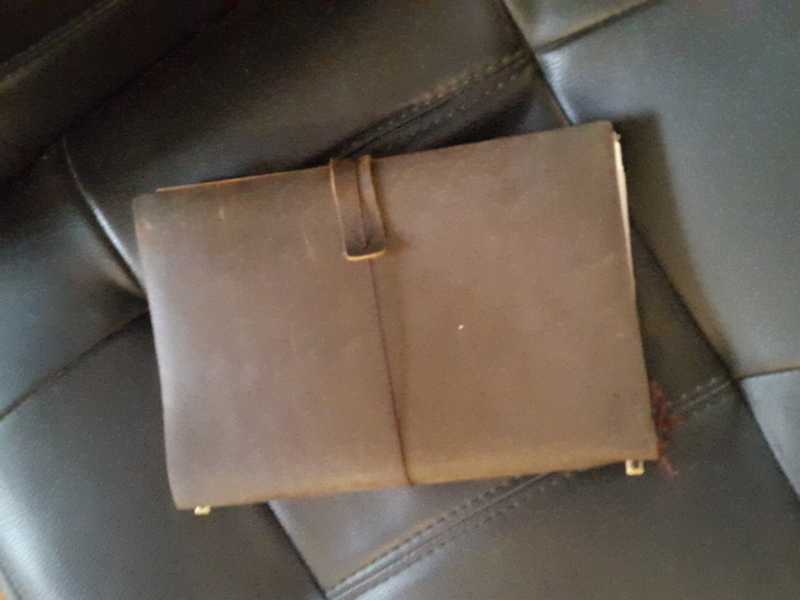 Nothing worked until I settled on the Traveler’s Notebook (TN). These notebooks, pioneered by the Japanese brand Midori, are simple leather notebooks strung with several elastics inside. 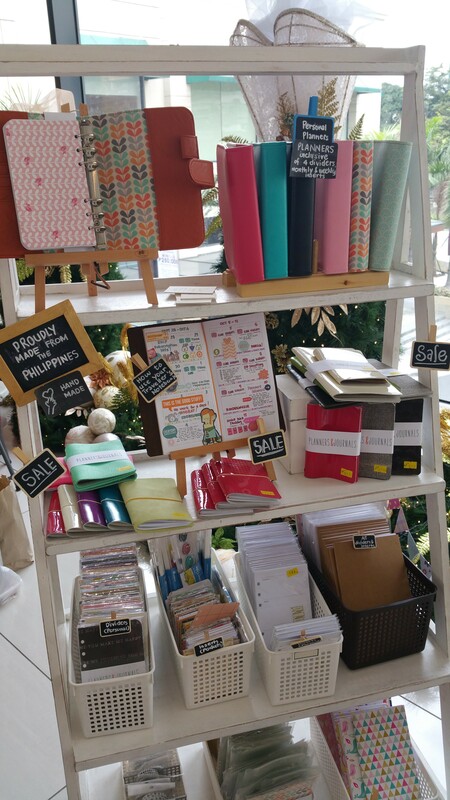 Midori sells special thin pamphlets of varying papers to slot into the elastics. In an original Midori, one can insert up to four -6 of these pamphlets. So now, instead of toting God knows how many books of varying sizes, you can carry several thing notebooks in a relatively manageable format. 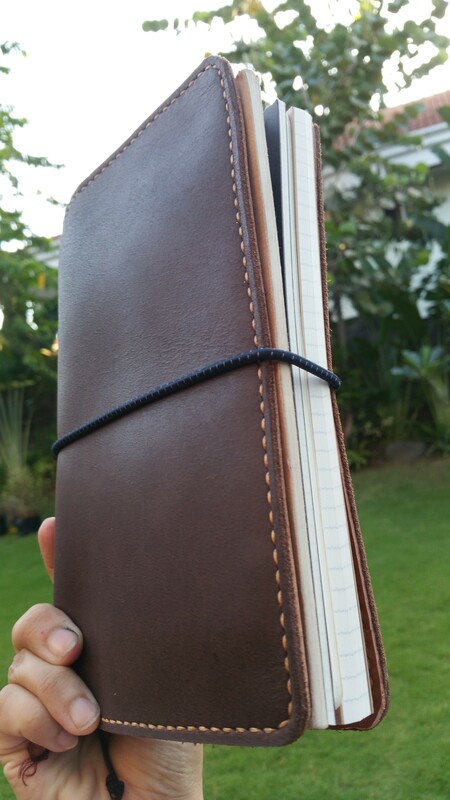 Unfortunately, the Midori either comes in a vertically-oriented size or a passport size , neither of which doesn’t really suit my writing style. I enjoy the A5 format (about 8 x 6 inches), which is slightly wider. 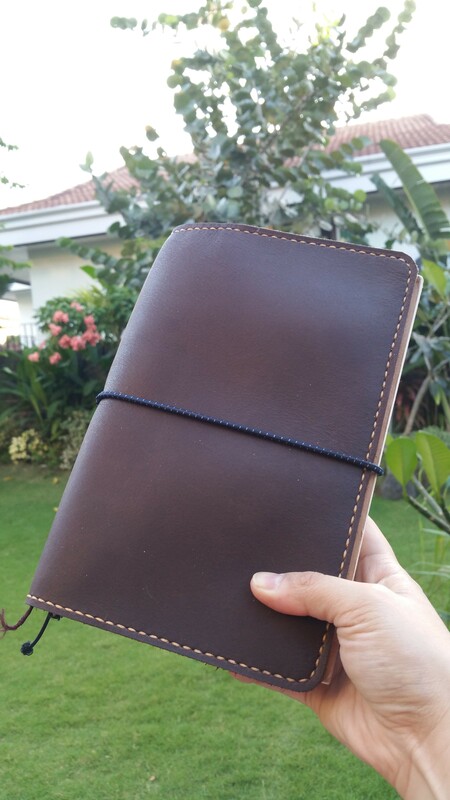 After reading about other creators manufacturing notebooks similar to the Midori (mostly small handmade shops, but also sometimes mass-produced in China), I purchased one of the China-made leather A5 ones from a local retailer/importer (@crafts_unltdph on Instagram). It was… satisfactory. The leather couldn’t match the Midori’s famed stiffness and the handwork didn’t quite match, but it served the purpose. 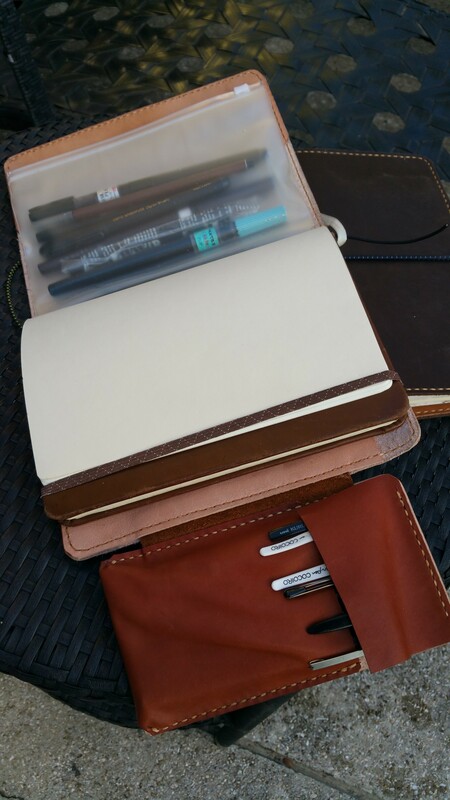 I filled it with Muji A5 grid notebooks (I LOVE these!) and some other handmade refills that I stapled together. I was happy…for awhile. Then I turned to Etsy and Facebook, curious to find out more about non-Midori TN’s (aka ‘fauxdori). The sheer variety of sizes, materials, and styles soon got me salivating for more than the basic Midori prototype. I wanted more features! More bling! More colors! More everything. 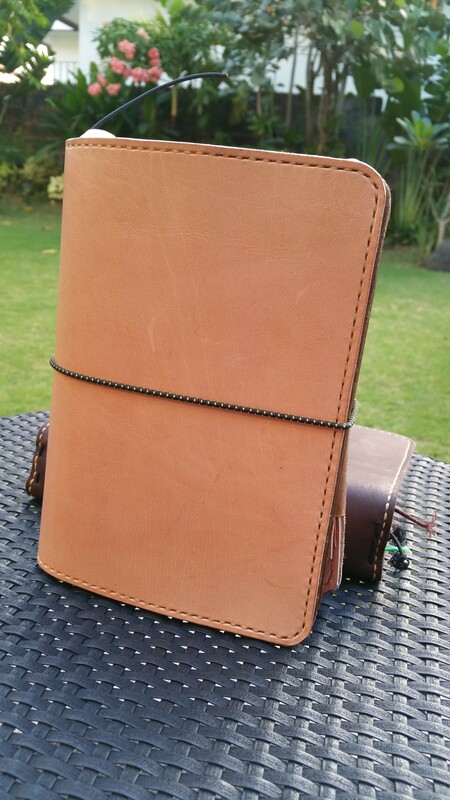 I commissioned a local leatherworker (who shall remain unnamed, unless you pm me) to create an A5 TN. The results were horrible, and I ended up having to restring the damn thing and name it Monstrobo for its hideousness. This almost turned me off Philippine TN’s completely, but I’m glad I persisted in locating other craftspeople. 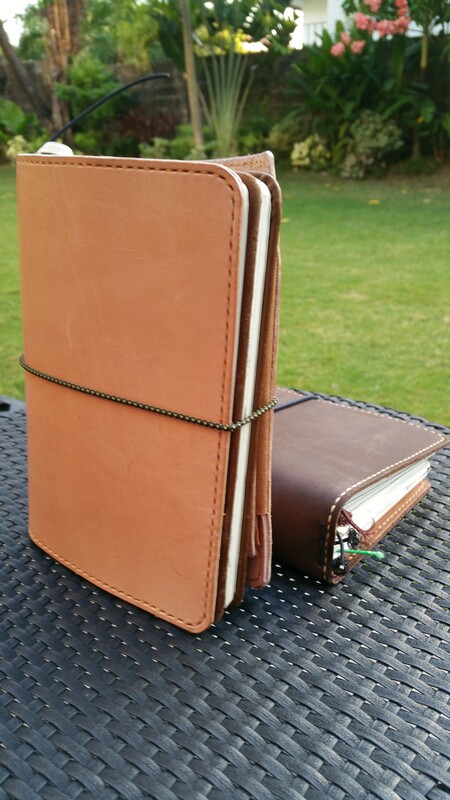 I contacted Sunday Leather Craft on Facebook, to create my first local TN’s in a specific configuration: Side pockets, 4 inner elastics, and a brown supple leather with border stitching. The results were amazing, and I fell in love with their work. 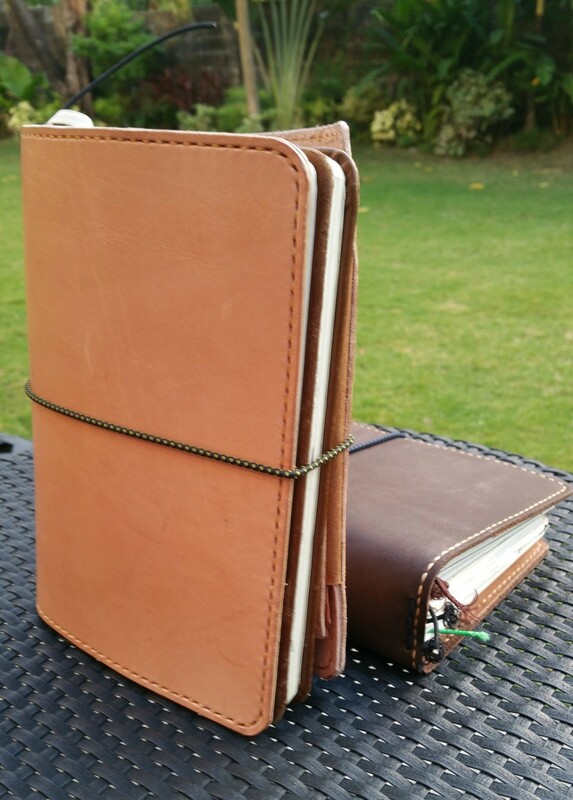 I commissioned a second one, this one with slots for pens and in a different beige /naked leather color, inspired by ones I’d seen scanning the net. Still loved it. This one will be my art journal, and I’ve repurposed my PVC folder into a brushpen holder. So now I own three fauxdori (and Monstrobo). Have I solved the notebook problem? Almost, but not quite. Now I want even MORE fauxdori!